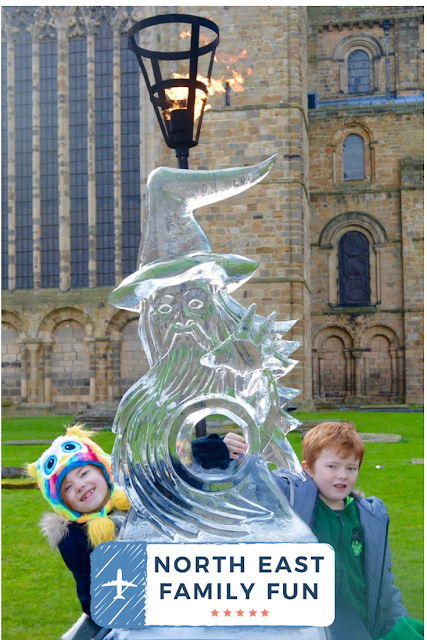 Fire and Ice Durham returns this February Half Term. The event is FREE to visit and this year's theme is Heroes and Villains. 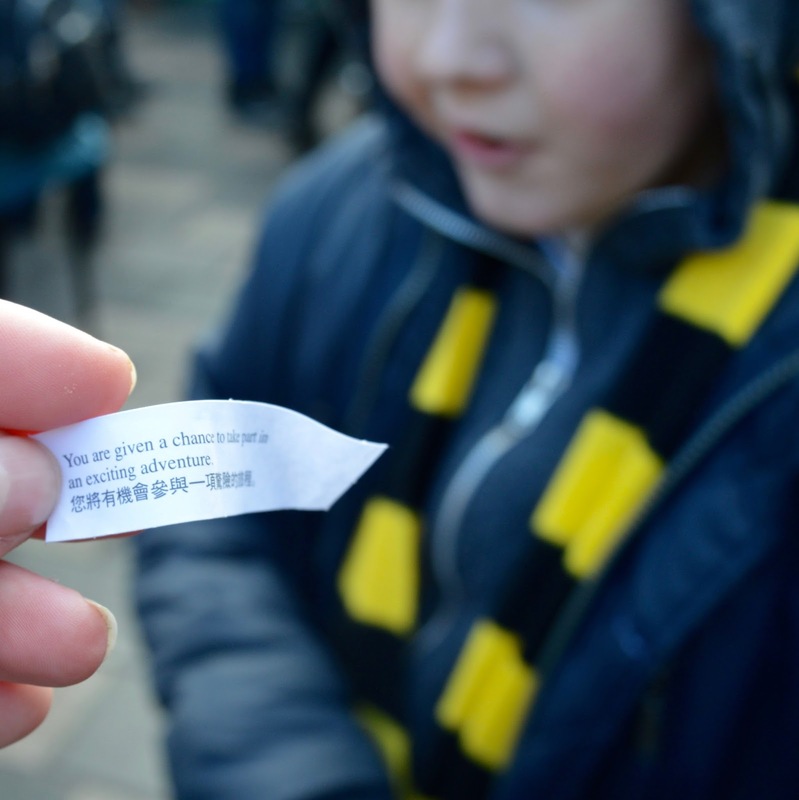 You don't need a ticket, simply turn up on 22-23 February and enjoy the free trail through the city. Today I'm going to share some top tips for visiting and hopefully help you to get the most out of the event. It really is worth seeing. 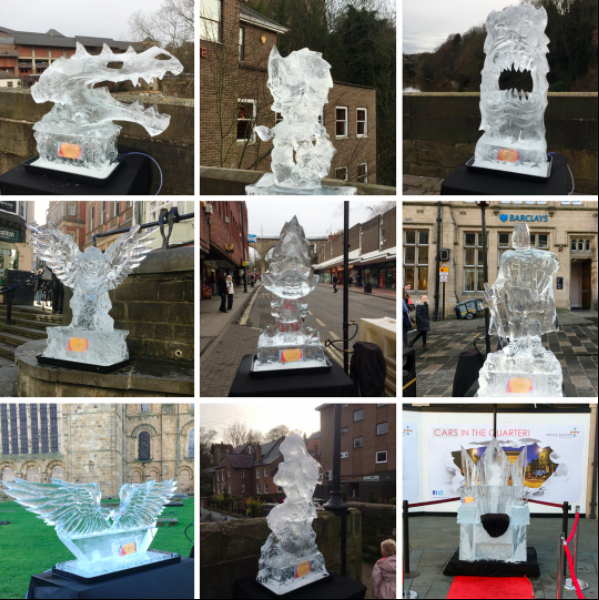 Fire and Ice is a free Ice Sculpture Trail in Durham City Centre. The trail should last around 45 minutes, is pushchair friendly and easy on little legs and a lovely way to get out and about with the whole family. This year's theme is 'Heroes and Villains'. 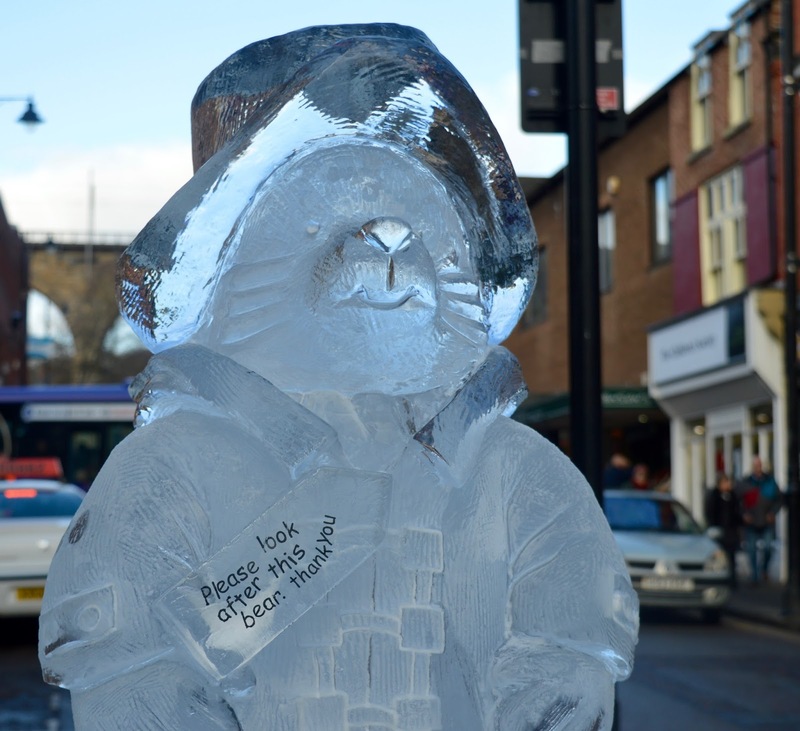 Expect ice sculptures from your favourite movies and TV shows. 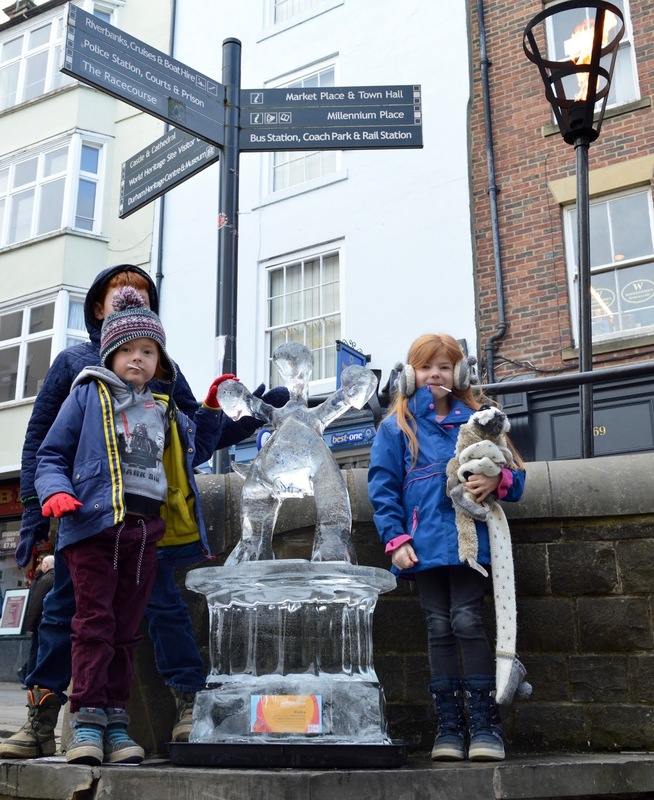 This year's trail takes place on 22-23 February 2019 and is FREE to take part. You can check out a trail map via the Fire and Ice website nearer the time or pick a physical copy up from one of the lovely volunteers you'll see by the sculptures in Durham (head to the Market Place for the first one). I'd recommend visiting in the morning to see the sculptures at the best. 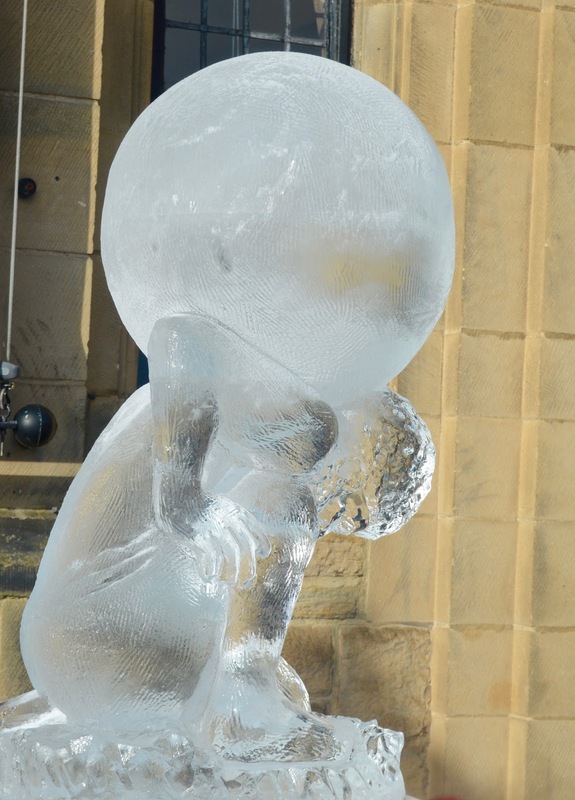 Often wind/rain/sun can cause the sculptures to deteriorate throughout the day. 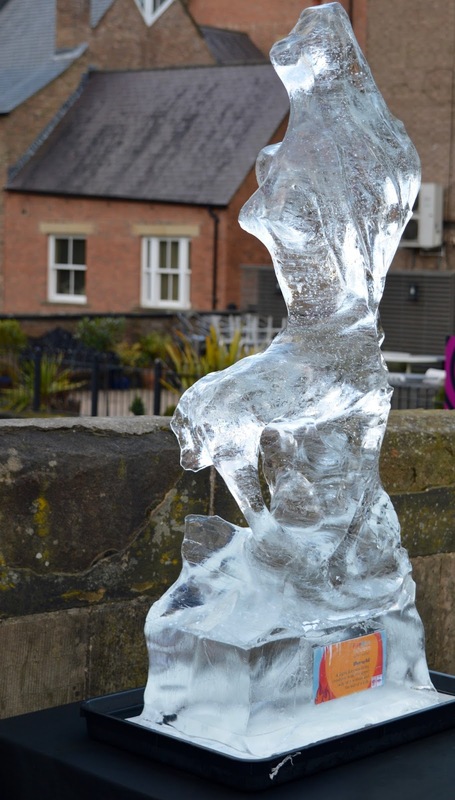 There are usually a couple of sculptures near the Cathedral. This is a good excuse to pop inside and have a nosey around (it's beautiful and child-friendly). Entry to the Cathedral is FREE (donations welcome). There's a bit of a hill up to the Cathedral, there is a bus that leaves from the train station and Market Place if you don't fancy the walk. It's FREE if you use Park & Ride or there's a small charge if not. See here for details. 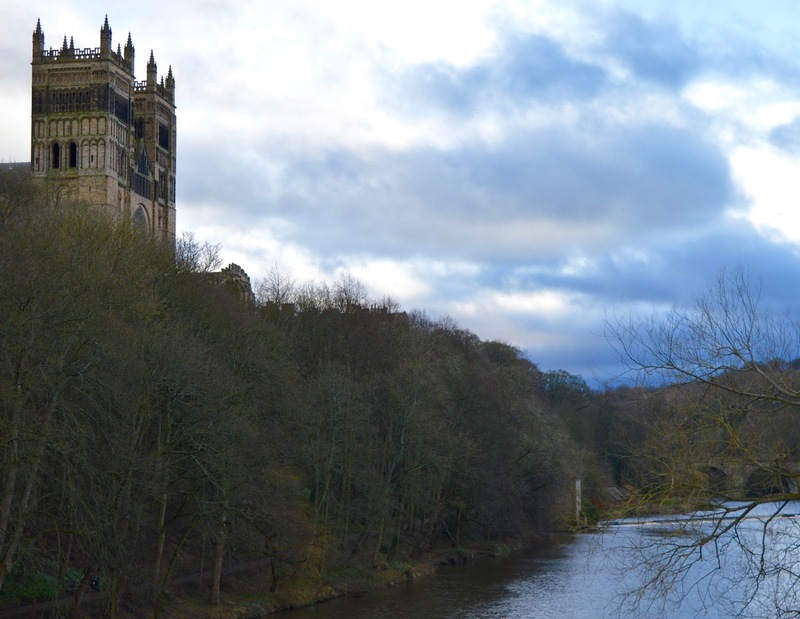 Durham is a gorgeous city and I recommend making the most of your visit and stopping for a bite to eat. 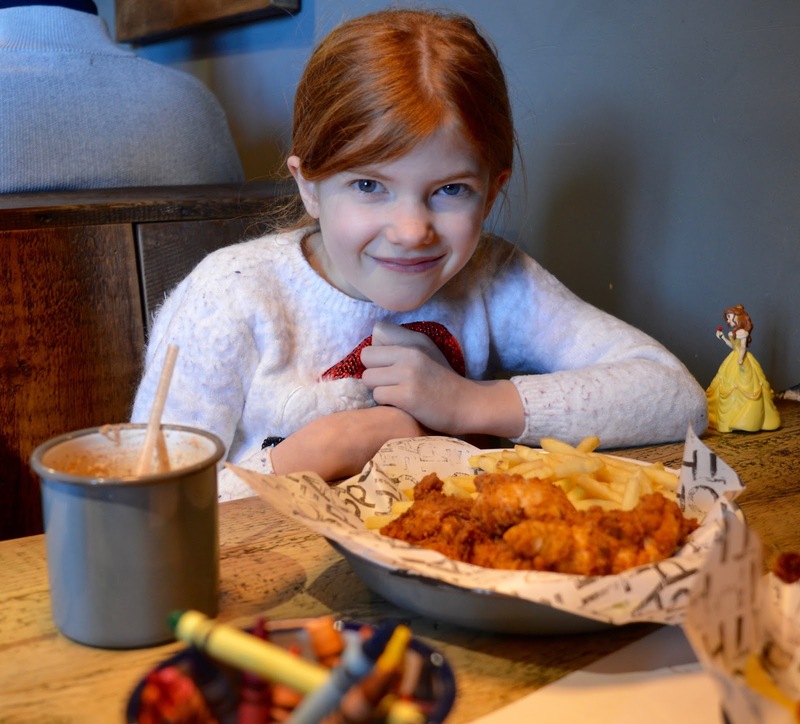 My favourite places to eat with the kids are Fat Hippo Durham or Bell's Fish and Chip Restaurant. There's also a Nandos near Gala Theatre. 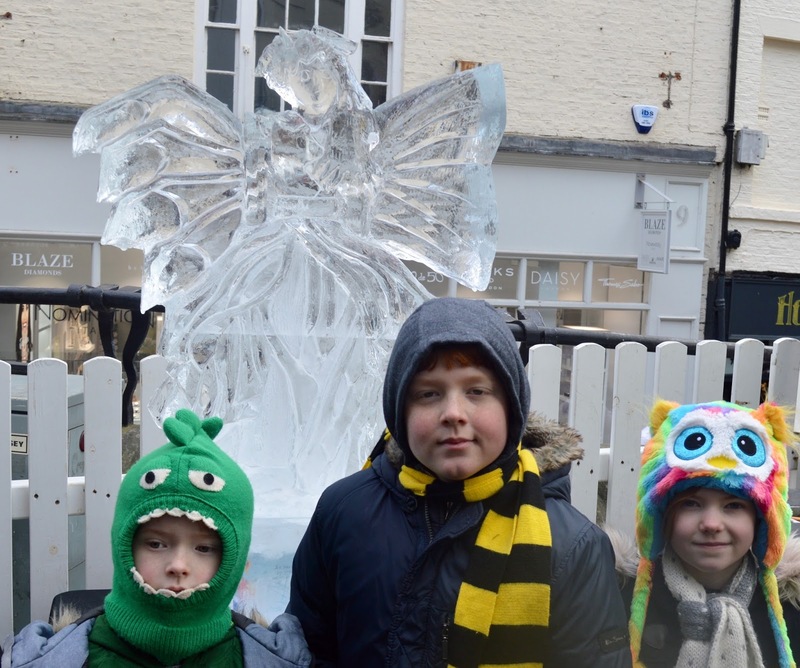 Often there is additional entertainment provided throughout the day - check out the Fire and Ice website nearer the time for details. 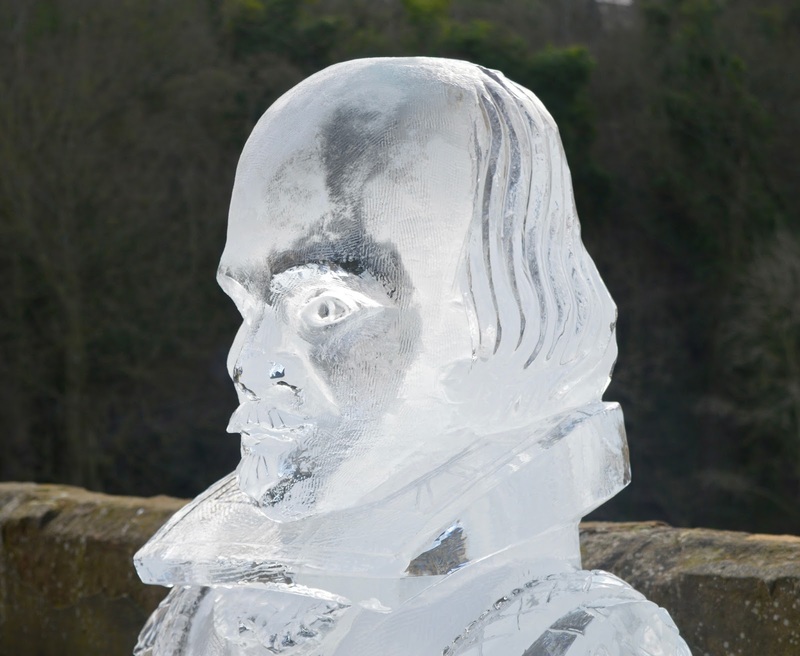 In previous years there has been live sculptures, street performers, music, a 'Sword in the Stone' and more. There are usually two big finales in Market Place with fire, music and lights. Timings will be announced nearer the time. These are free and worth seeing (but be prepared for it to be busy). 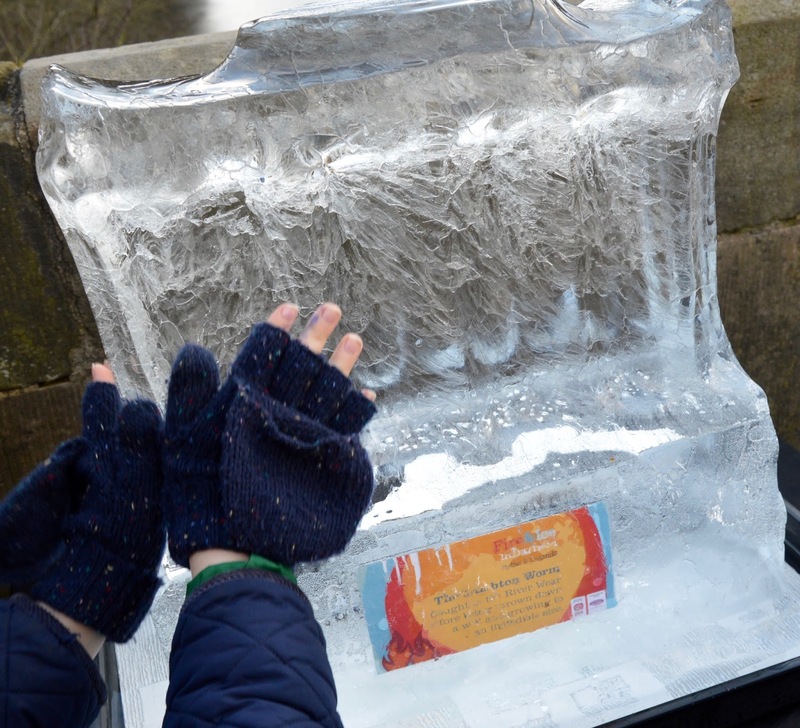 For the past two years, there's been a chocolate challenge with lots of chocolate bars frozen inside of an ice block. Spoons are provided but it's popular so I'd recommend bringing your own spoon from home if you think the kids would like to try this (and I imagine they will). We usually use Belmont Park & Ride which is just off the A1 and very convenient. 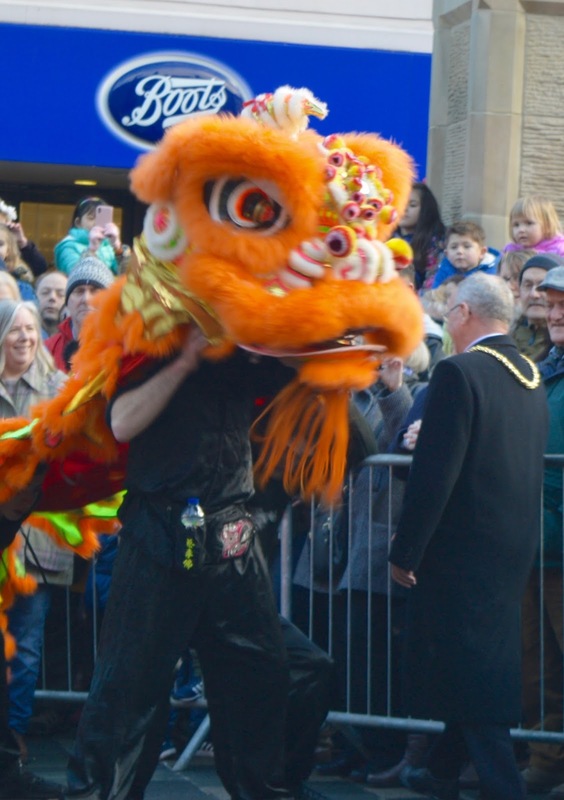 It's £2 per adult and under 16s are free for unlimited travel on the park&ride and Cathedral buses. See here for details. Durham Train Station is also within walking distance of the trail and here's a list of City Centre Car Parks if you'd like to drive in (all are within easy reach of the trail). 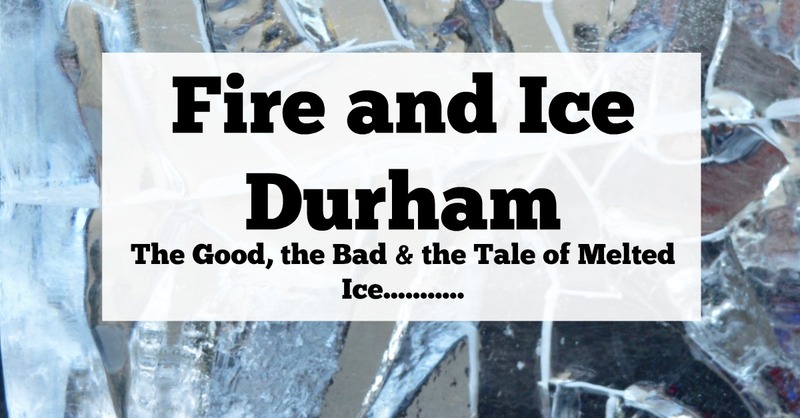 What I love about Fire and Ice is that it forces us to explore Durham which really is a gorgeous city and somewhere I always leave wanting to revisit again soon. 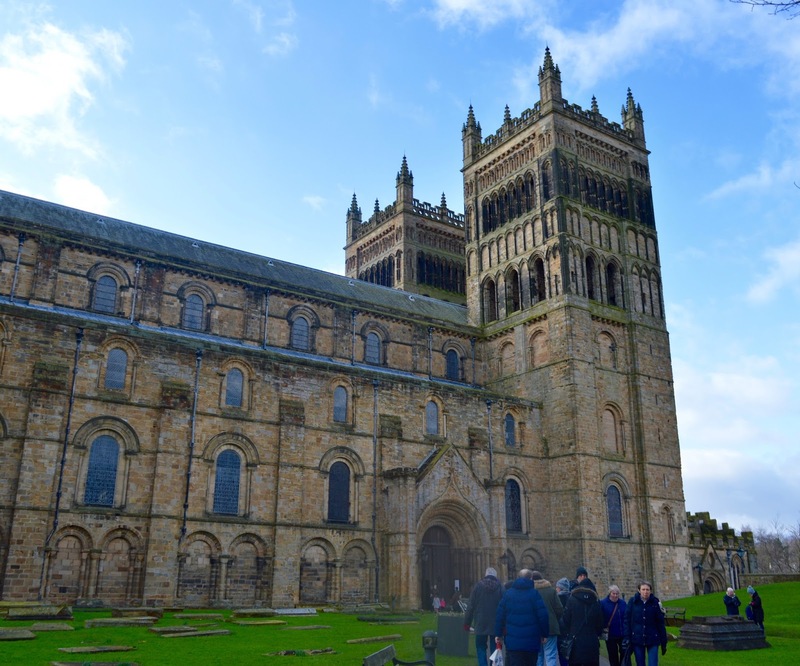 We visited Durham Cathedral for the very first time and if it hadn't have been for Fire and Ice I bet we still wouldn't have stepped foot inside which is some kind of crime! The Cathedral is free to visit and absolutely stunning inside. Sadly no photography is allowed inside but you'll have to take my word for it that you should visit. 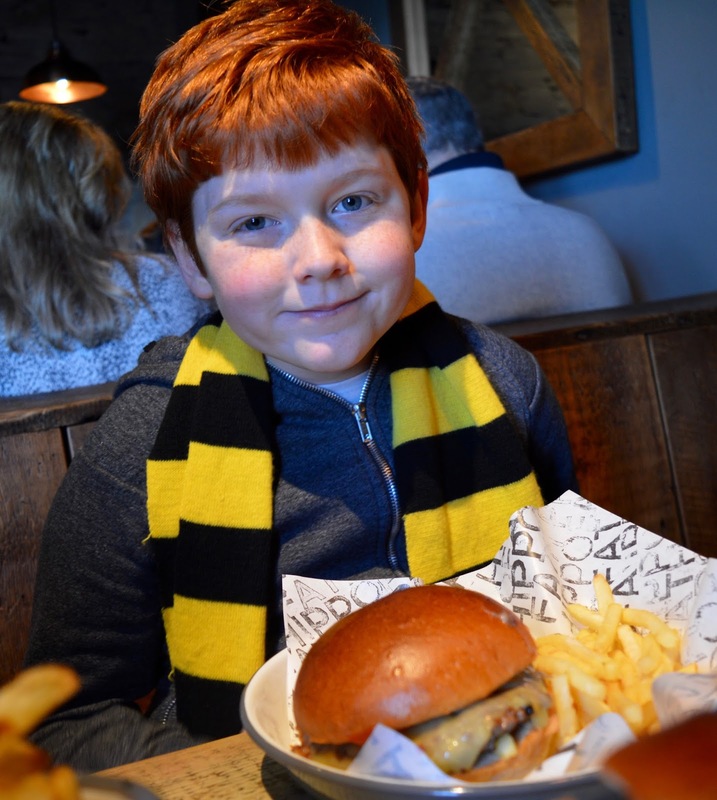 Don't feel scared about taking your kids there either, my three really enjoyed it (and part of Harry Potter was filmed there which I'm sure they'll appreciate). We stopped at the Cathedral restaurant for coffee and cake which were both top notch. I remembered from last year that Durham's restaurants were always super busy so I booked a table at The Fat Hippo in advance. 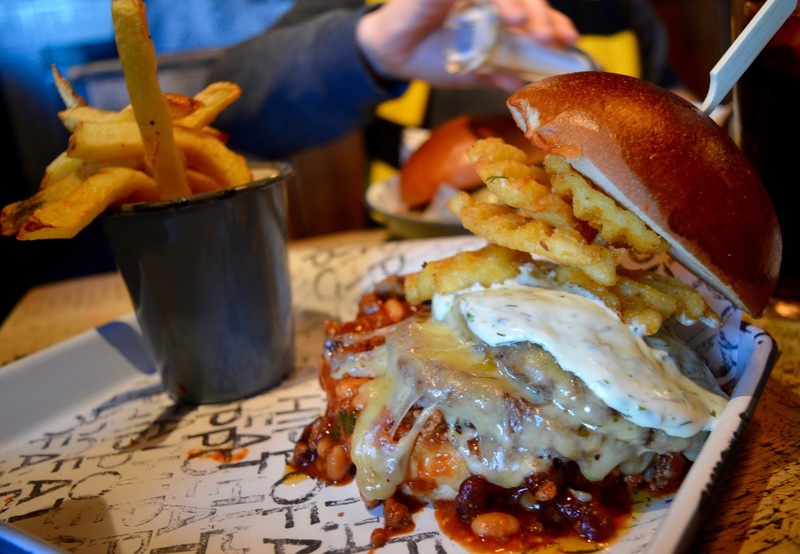 Steve had yet to visit this particular branch of his favourite burger joint and had his eyes on their Valentine's special (Smokeback Mountain) which was still available. 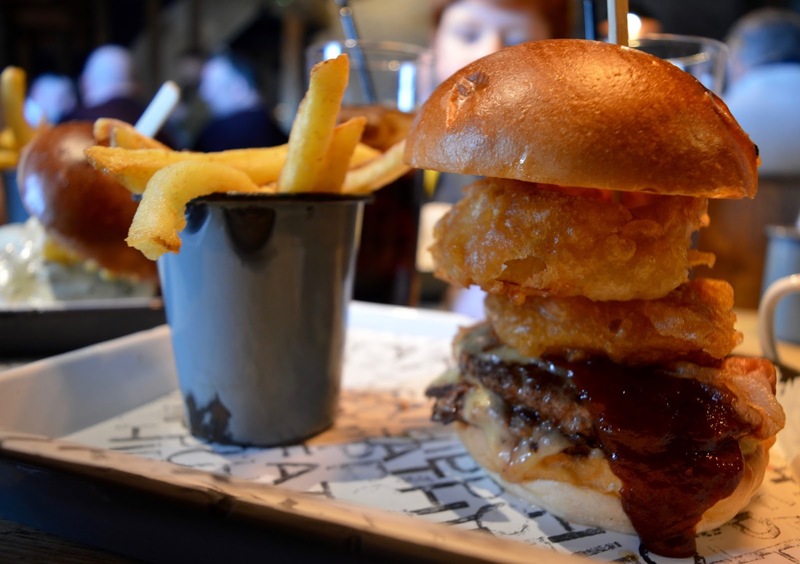 Fat Hippo Durham did not disappoint at all. Kids and grown-ups devoured the lot. Our meal was £50 for the 5 of us which I thought offered good value as we were all stuffed and satisfied. 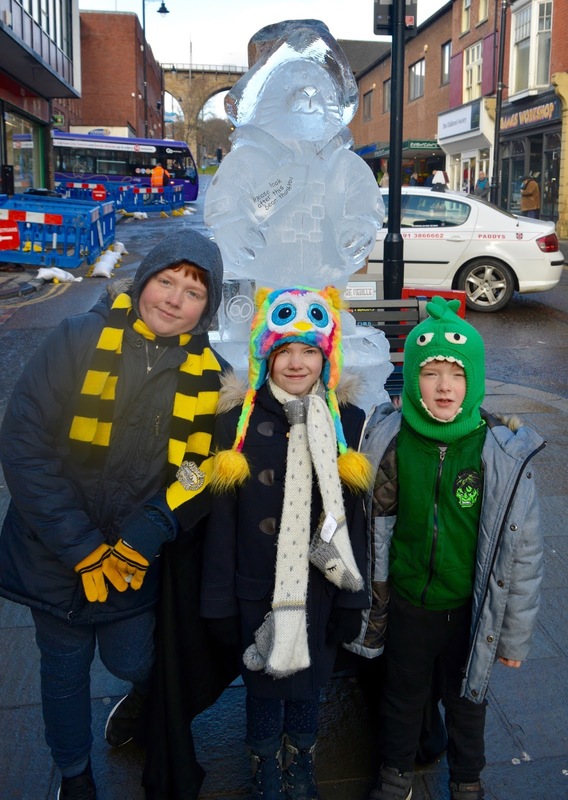 I had promised the kids (and Steve) that we could watch Black Panther at the cinema as part of our day out but was disappointed to see that it wasn't showing at the Gala Theatre. I had planned to watch it there in the afternoon and then we'd be able to catch the Fire and Ice finale afterwards. It wasn't meant to be though and with 5 hours to spare until the finale we decided to head back to the car and head to another cinema instead. A couple of cool things happened on our way back to the park and ride bus stop though. 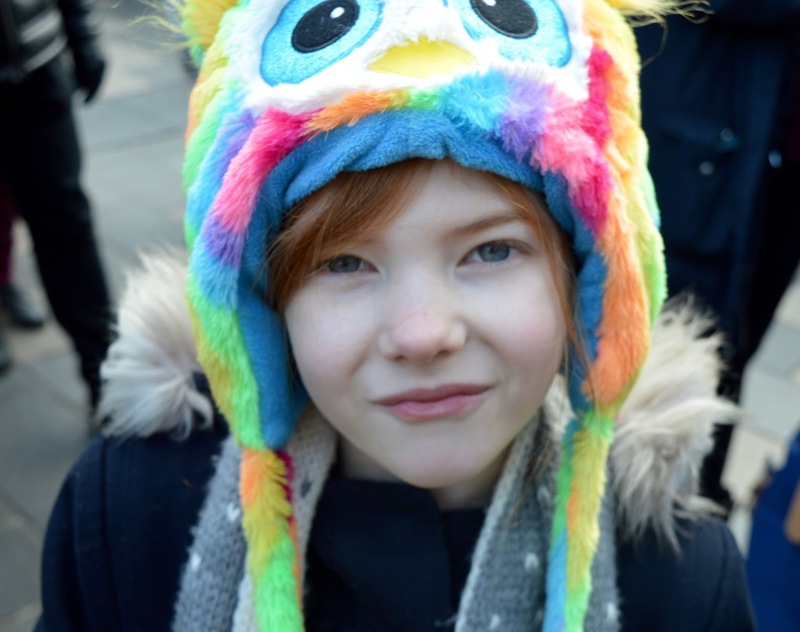 Firstly, I was approached by a member of staff outside New Look as we walked past. Apparently, it was their Random Act of Kindness day and as I probably looked like I had my hands full with three tired kids in tow, they said that I deserved to treat myself and handed me a New Look gift card with strict instructions to treat myself. How cool is that! I did just that and bought a lovely new handbag. Then we decided to head over to the chocolate in ice and try and de-ice a chocolate bar with the spoons provided. We weren't in luck this time but it was fun trying! 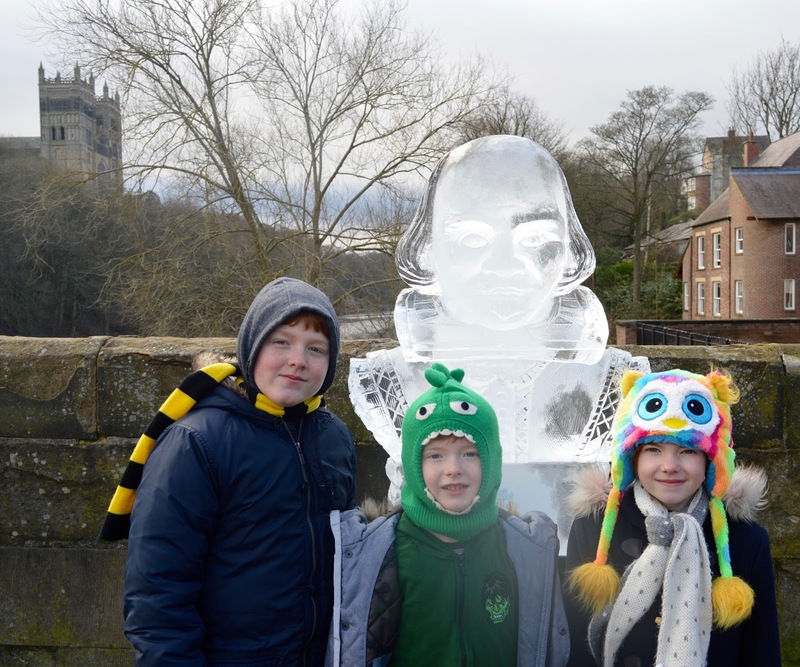 We had the best time in Durham and enjoyed the trail and the fantastic work that was clearly put into the sculptures, the Chinese New Year celebrations, visiting and supporting the local markets, our first trip to the Cathedral and of course an excuse to enjoy the best burgers in Durham. The event was a huge success and although we missed the finale, arriving first thing was definitely the best way to experience the event. I am already excited to see what next year's event will bring. 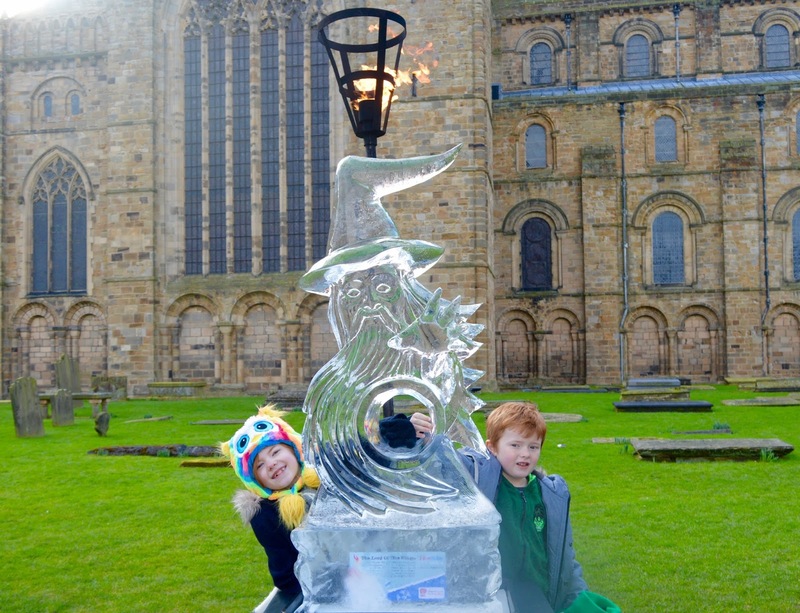 You can keep up to date with events in Durham and news of next year's event via the Durham BID website here. 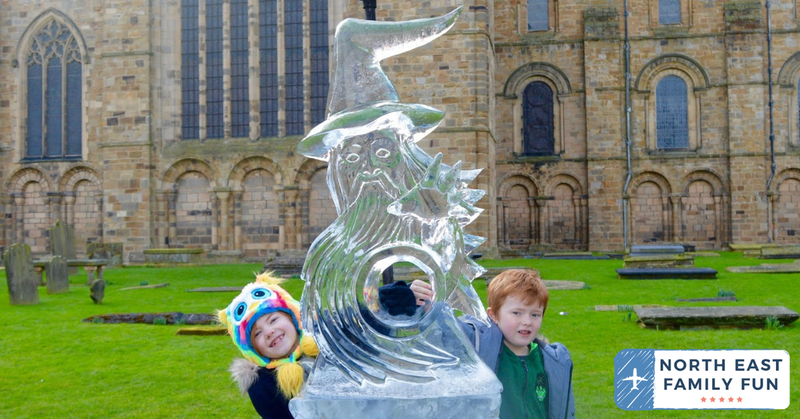 Fire and Ice Durham 2017 was a FREE family event. 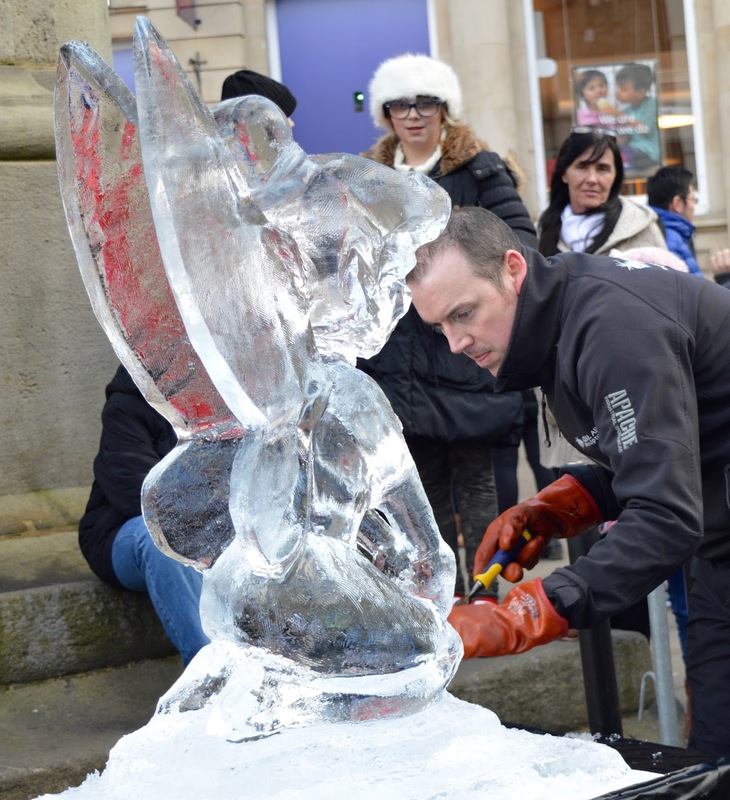 Featuring a trail of 10 ice sculptures based around myths and legends and ending with two spectacular finales. We headed along on Saturday afternoon to take part. 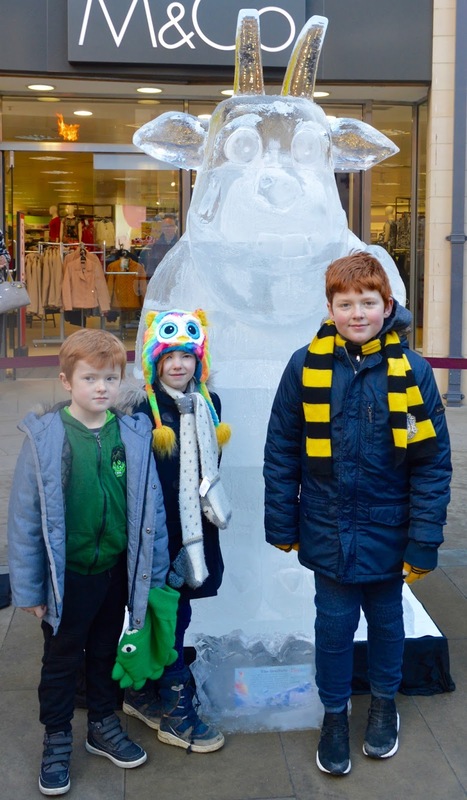 I have not taken my children to Durham before and the free trail was a fantastic way for us to get to know the city whilst having fun. 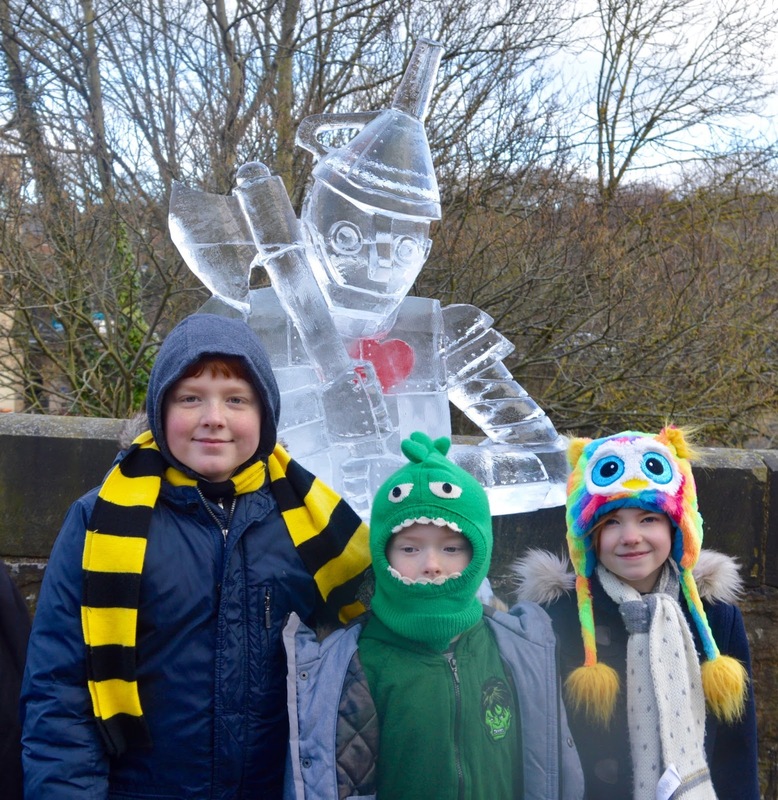 The kids loved walking around looking for the fire beacons above their heads and ticking off the 10 sculptures from our trail map (available from one of the many staff). 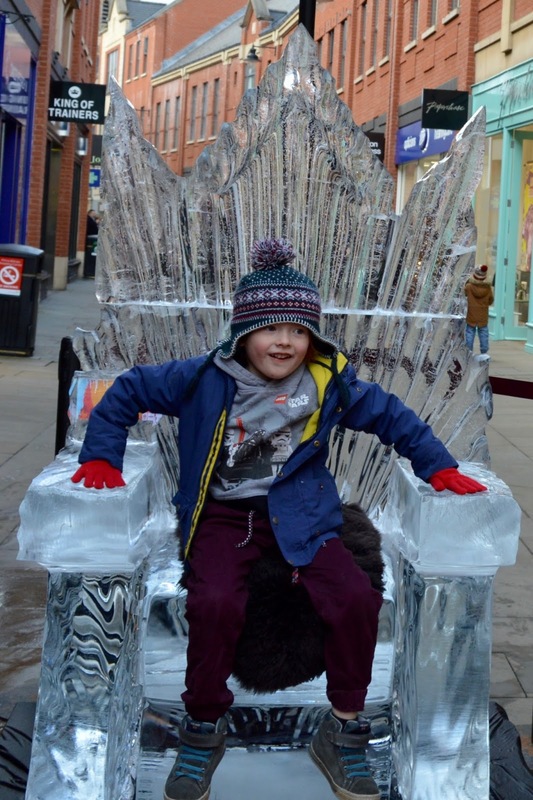 The throne was our favourite sculpture and H & J loved taking a seat and pretending they were the ice King/Queen. 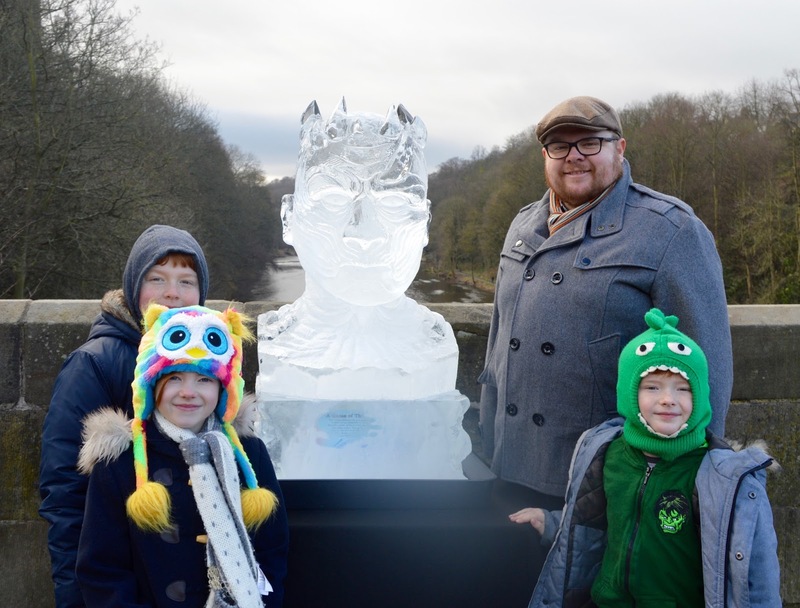 I also loved that it was something the whole family could take part in - my mam and her husband work shifts and it is a very rare that we can all go out together - as they both had a day off, it was free and something I thought they'd also enjoy, the came along too and it was nice to spend some time with them. 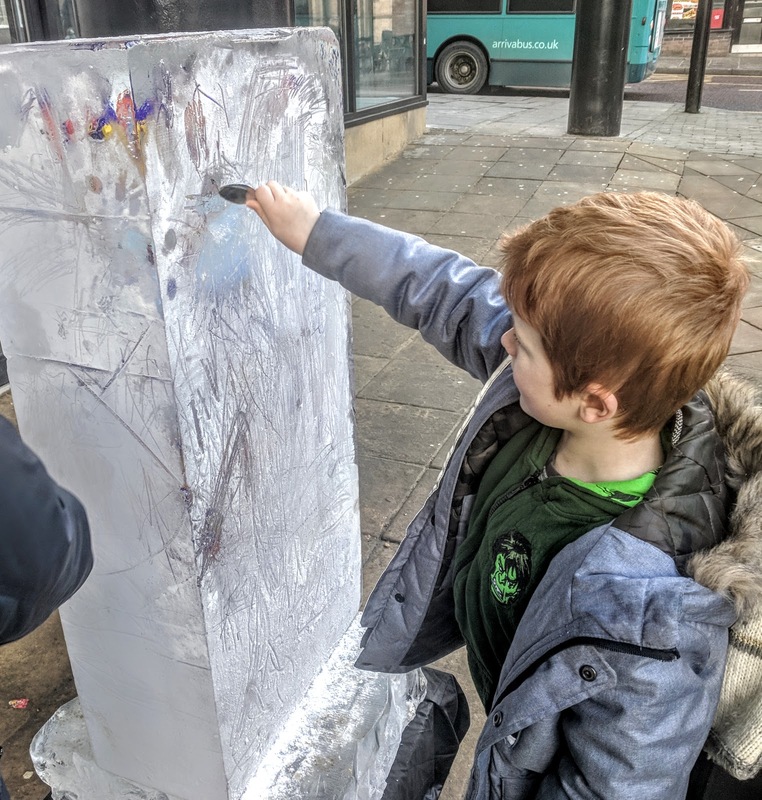 Harry enjoyed trying the sword challenge - if you were able to pull the sword from the stone, you'd win £40 worth of vouchers. He wasn't lucky this time but it's the taking part that counts right? 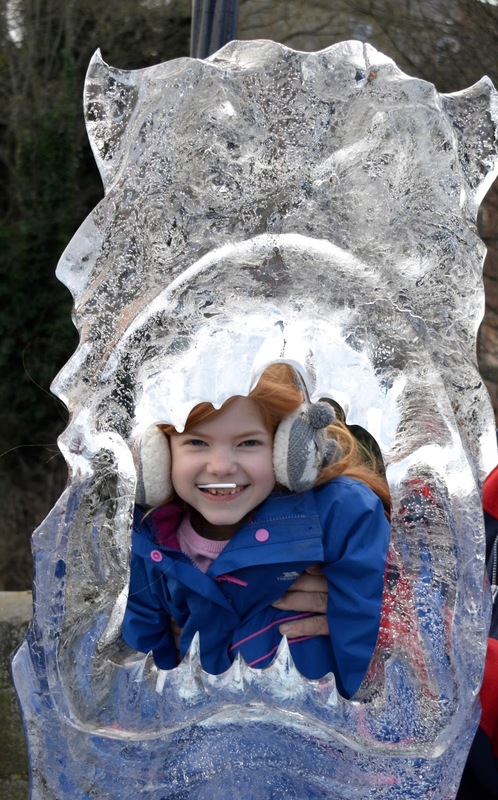 We also loved peering through the Dragon's mouth and watching the ice sculptures in action - how fantastic is Tinkerbell? Considering this was all COMPLETELY FREE we think the event was superb and would highly recommend a visit. 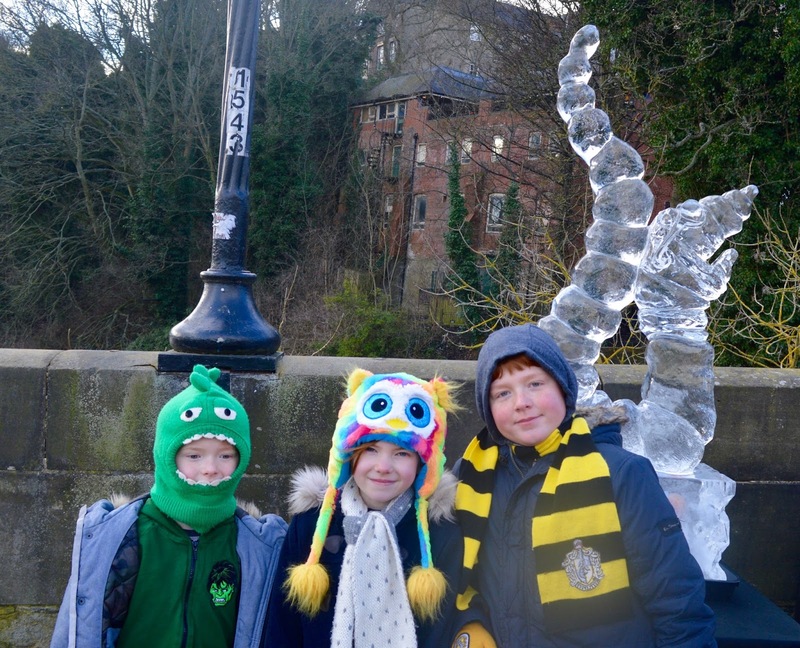 We loved exploring Durham and I don't think we would have visited the City and explored on foot like this had it not have been for this special event. The kids were looking forward to the chocolate bar melt, this was not available on Saturday as it had been completed on Friday - next year I would suggest they make one for each day. We wasted 20 minutes searching for it before we found out it wasn't available today. 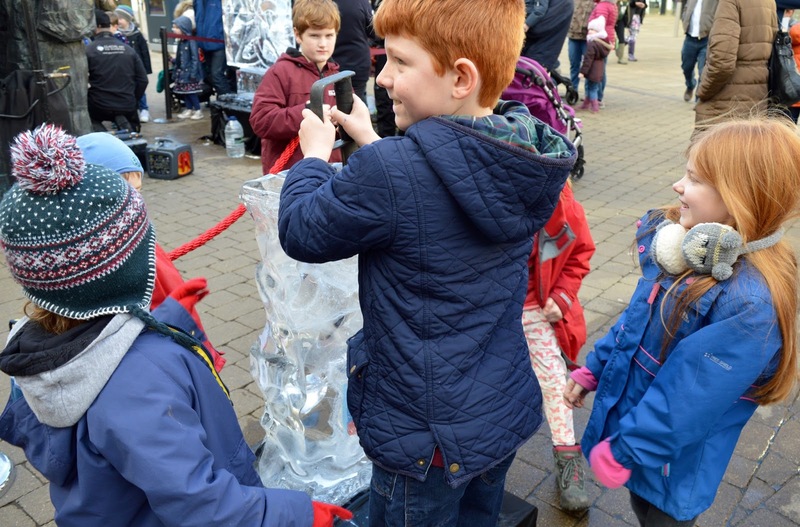 H, H and J were keen to have a go at sculpting themselves and joined the queue. The queue was too long though and we stood in it for 7 minutes and the same girl was still sculpting - there were 20+ children in front of us so if everyone took the same length of time, it would have taken us over 2 hours to get to the front. We did not fancy queuing for this length of time so did not bother waiting. 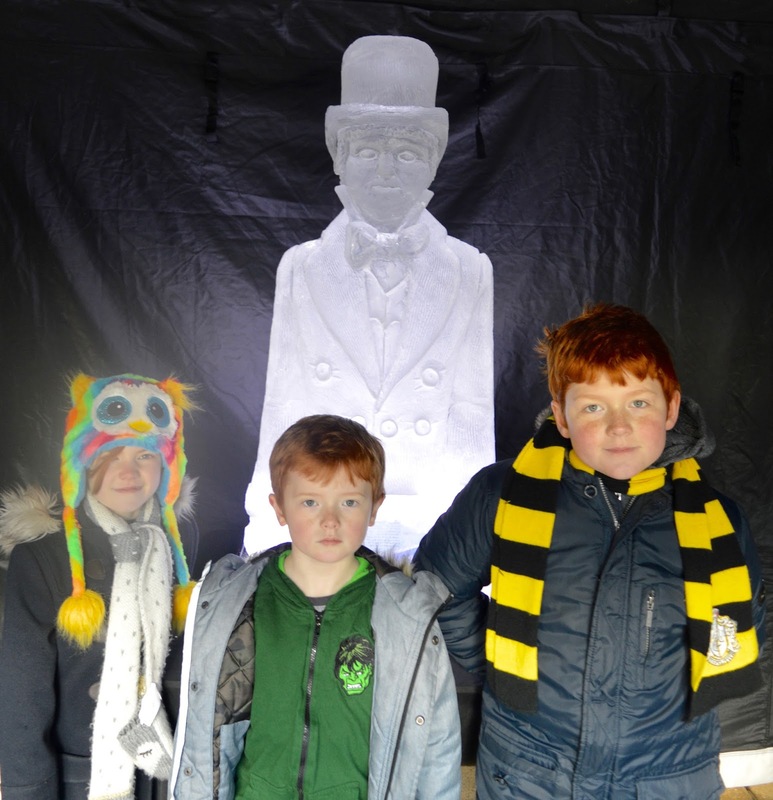 Next year I would love to see more chances to join in or free timed tickets given out so children didn't have to queue. We started the trail at 2pm - we thought that 3 hours would be the perfect amount of time to view the sculptures and have a nice coffee before the finale at 5:15pm. 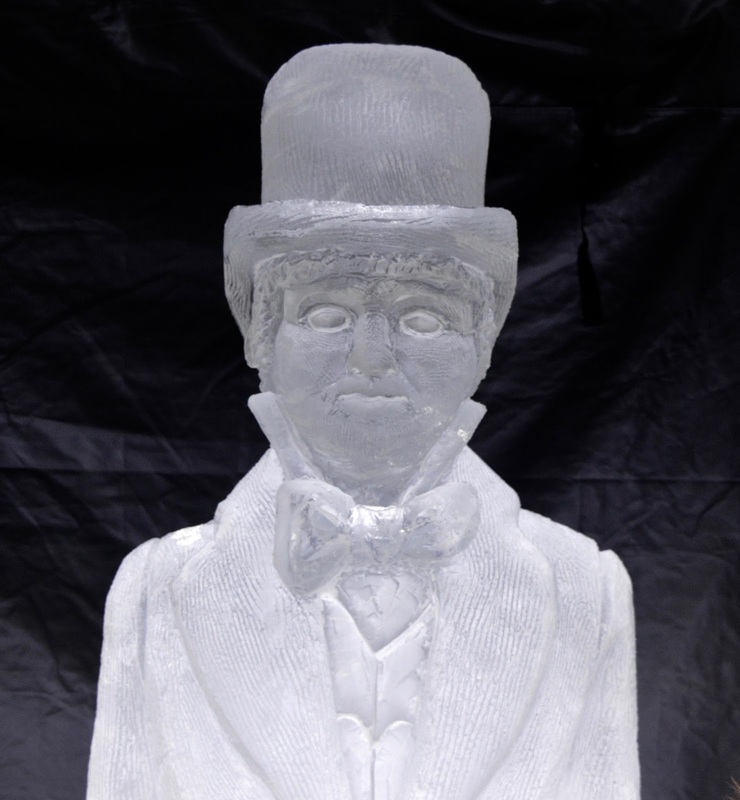 Unfortunately, most of the sculptures had started to melt quite a bit and certainly weren't as detailed as expected. 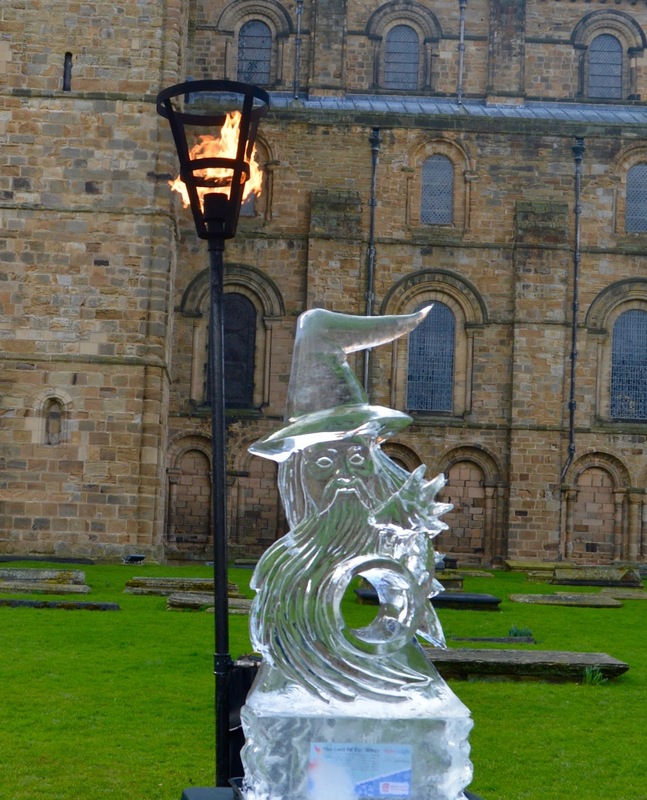 One of the stewards told us not to bother heading to Durham Cathedral as that sculpture had collapsed. Apparantly, the high winds had caused the sculptures to melt ahead of time which I suppose can't be helped but we were still disappointed. Despite our disappointments though, we still had a really great day. Jack (6) rated the day 1000000/10, Harry 5/10 (he was really looking forward to the chocolate bar challenge) and Heidi (7) gave it 10/10. I would also give the day a solid 9/10. 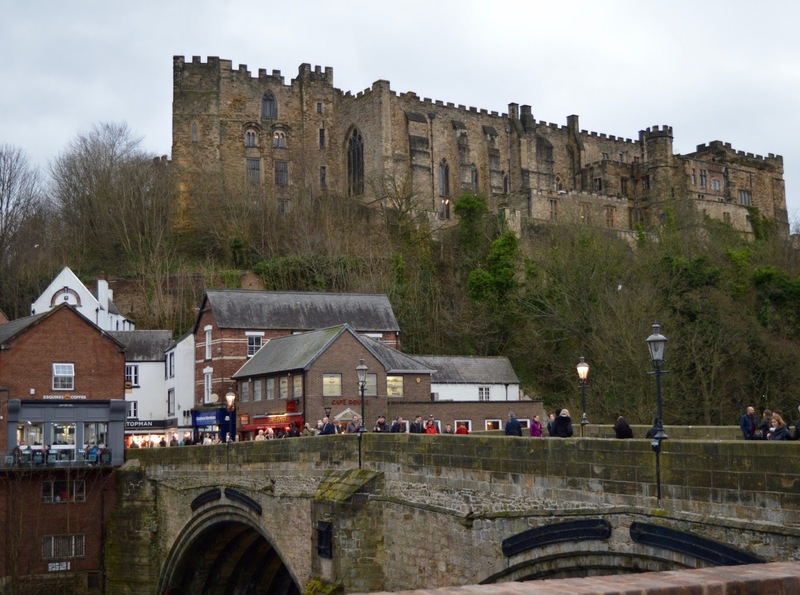 I think it was well organised and a lovely way to explore Durham. The finale was also spectacular and really entertained us grown ups and kids. 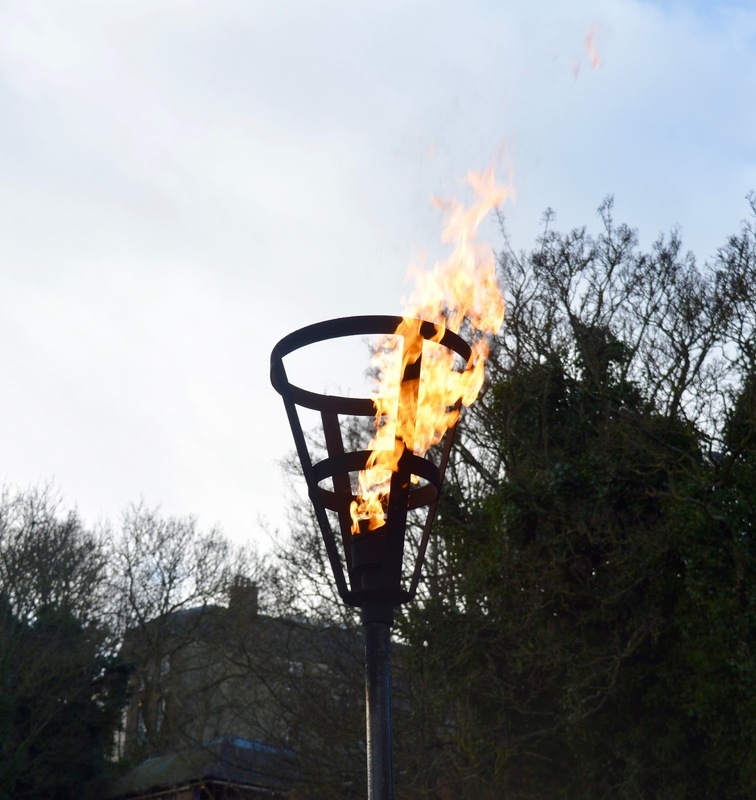 The atmosphere was fantastic and there were fire jugglers entertaining the crowd in the build up. One of the reasons I've always been put off visiting Durham is the whole parking situation. We decided to use Belmont Park and Ride though which was super easy. It is just off to A1 (Southbound) at Junction 62 (turn left at the roundabout and follow the signs for park and ride). It was super efficient and only £2 return for adults and kids were free so it was a real bargain. 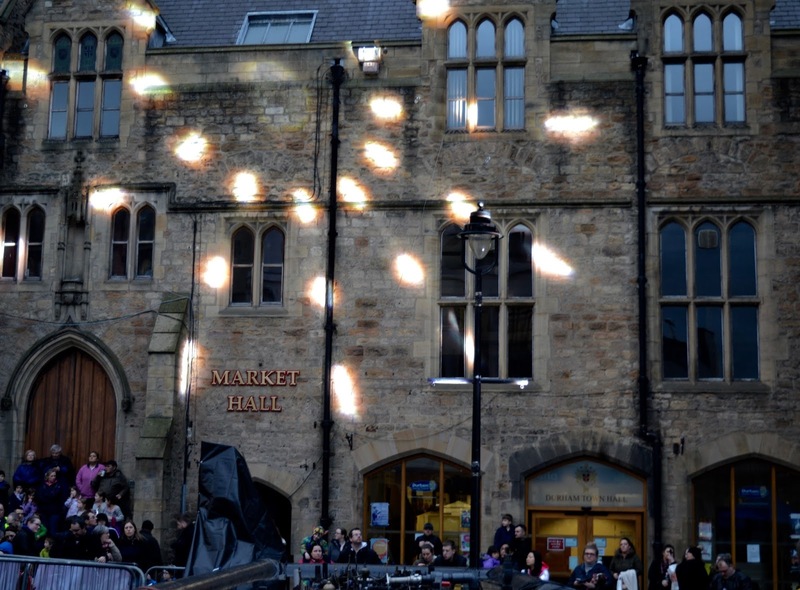 Buses are every 10 minutes and drop you right by Market Place and collect from outside the Gala theatre. It was so easy to use and I'd recommend. If you're planning on visiting Durham a few times throughout the year, I would recommend buying an InDurham Loyalty Card. They cost £5 for 12 months worth of discounts including 30% off food at Bella Italia or 20% off food at Bills. We really fancied Fish and Chips and I would definitely recommend Bells Fish and Chip Restaurant. We managed to score a table right by the window and it's a fab spot for people watching. 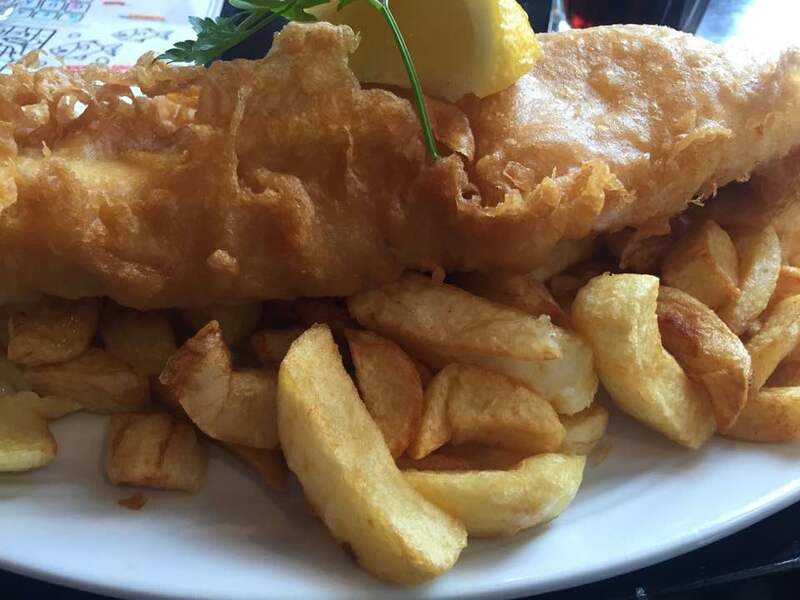 The fish and chips were beautiful too - the best I've had that haven't been by the sea. 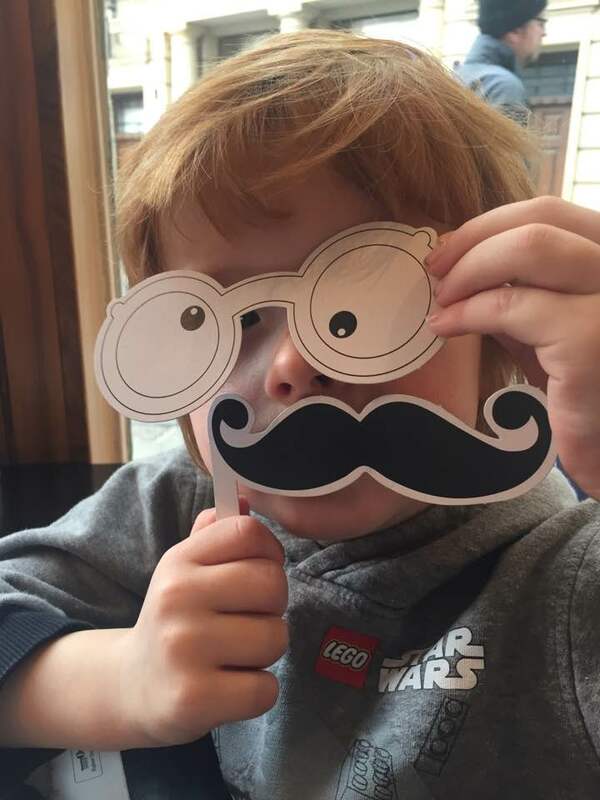 Kids were well looked after with Instagram props, word searches and puzzles and the staff were lovely. It was £56 for 3 adult meals, 3 kids meals (inc ice cream) plus drinks and all the trimmings which considering the quality, service and location, I think was very good indeed. 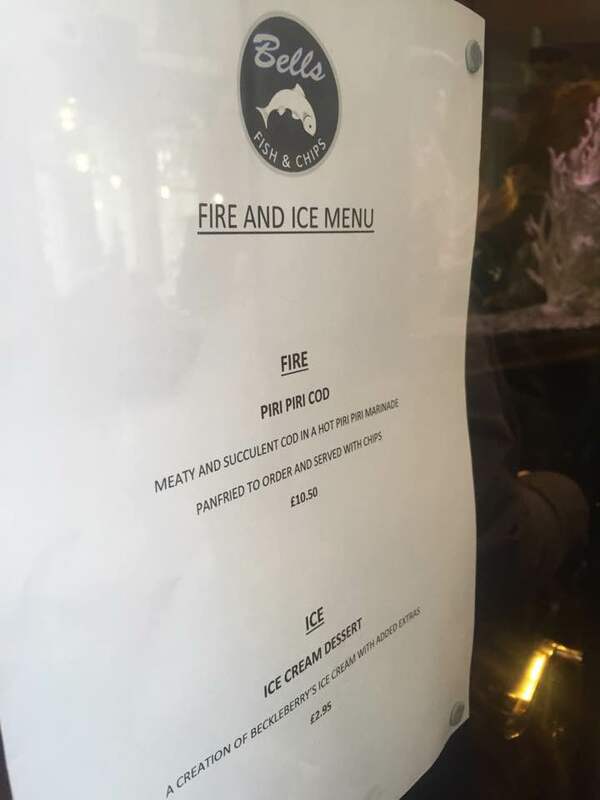 They were also running a special Fire and Ice menu which my Step Dad tried and enjoyed. We spent 4 hours in Durham and really had a lovely afternoon. It helped that the weather was on side! We enjoyed our day so much that we've already planned a return visit with Steve next month to see more of Durham and the Cathedral. Fire and Ice has ended now (it was just a 2 day event) but I do hope to see it return in 2018. Fingers crossed! 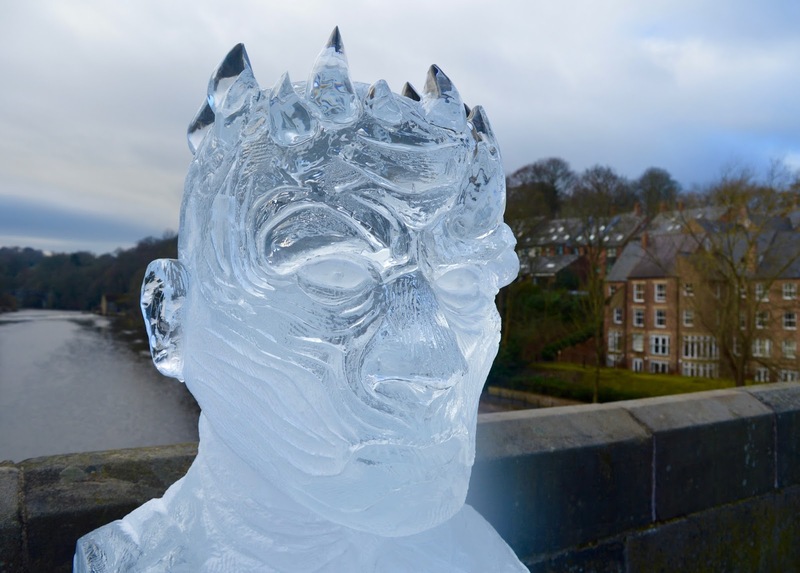 Let me know if you visited Fire and Ice this year and your thoughts. Thanks! Didnt know about this until now! This looks awesome! They need to get more bloggers involved in future - if it wasn't for this I wouldn't have known about it! If I had known earlier on we would have gone. We decided to go on Friday after seeing your original post about it. Growing up near to Durham, I decided to drive in as I know all the little nooks and crannies to park my car, but it was horrendous! There were so many roadworks, all the junctions were jammed and after 1hr of trying to get parked (incl. Prince Bishop's multi-storey which was operating a 1 in/ 1 out method) I admitted defeat and just went to visit my parents who live in Washington! In hindsight I should have taken the park and ride like you, but I didn't expect it to be so busy. A lesson for next time! I'm glad you had such a lovely day, it looked great fun! This looks such a great event - how fun to explore the city with the trail, and even better when it's free. 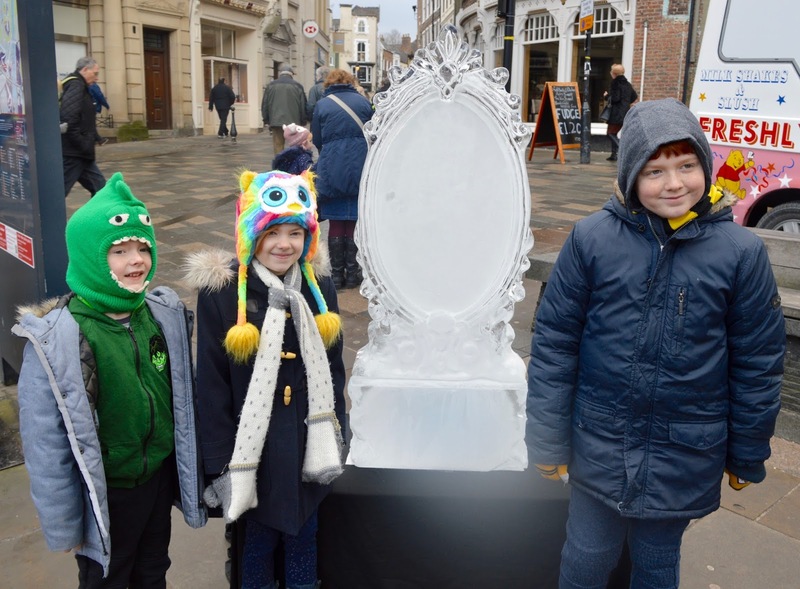 I suspect my daughter would have sat in that ice throne, announced she was Elsa and stayed put until her bum was numb :) Hopefully they can sort some of the teething problems for next time. This looks like a fab place to go with kids. Thanks for the tip re: voucher! What an awesome event - really love it! 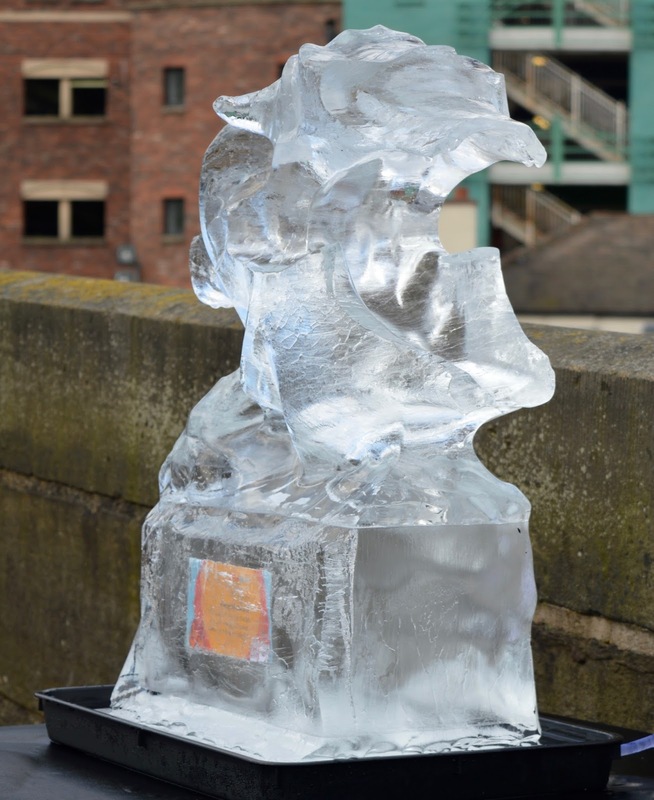 Watched ice sculpting on a cruise once (the ship's dentist's hobby!) It's so cool (excuse the pun). Love your photos. Friday Nights Out - Oh How They've Changed!